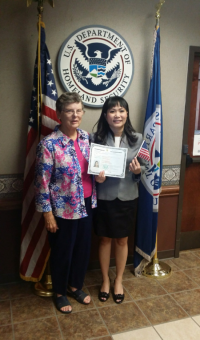 On Friday, September 5, 2014, Que Do became a United States citizen. Que started in 2012 as a student with the Literacy Council knowing very little English. Her tutor, Barb, has worked diligently with Que for two years teaching her to read and write English. Today, Que works for a manicure salon after staying home until her two children started school. Que passed the Citizenship with flying colors! She is very proud and we are proud of her. Congratulations Que on earning your U.S. Citizenship! Two LCBC English as a Second Language (ESL) students will be ringing in the 2014 New Year as American citizens for the first time. Lac Tran and Kam, students of volunteer tutor Richard Wells, answered all of the 100 possible citizenship test questions correctly. They also knew all the possible answers for the questions. For example, if the question asked to list one of the states bordering Canada, Lac and Kam could name all of the states. Lac is from Vietnam and Kam is from China. Both have been working on their English skills, reading, writing, and speaking, for several years. Lac and Kam work to continue improving and polishing their English and are making excellent progress. LCBC ESL student Arley Bejerano stepped on U.S. soil for the first time on October 31, 2009. Born in Sancti-Spiritus, Cuba, Arley wanted a different life – a life in the United States. On his first try, his boat ran out of gas and they were forced to return to Cuba. Arley saved up enough money to try again and was successful the second time. He went to the consulate in Miami to register and now has his green card. Arley has graduated from High School, attended college, and became a computer programming teacher. He moved to NW Arkansas before the end of 2009 and the Catholic Immigration Services here brought him to the Literacy Council of Benton County (LCBC) for help with English. “I owe a lot to LCBC; I came here knowing only a few words and now my vocabulary is very extensive and I can understand my co-workers and my bosses.” said Arley. Arley started working by volunteering in a restaurant to gain experience, and then he was offered a job at Wal-Mart. At one point he worked both of these jobs simultaneously. Arley’s goals are to start a family, raise children in a safe environment and provide them a good education so they can achieve their dreams. He wants to go to a University for a degree in marketing while he continues to work for Wal-Mart. Arley’s story reminds us how lucky we are to live in the U.S.A., and how often we take our opportunities and our freedom for granted. Update as of May, 2012: Arley is now a LCBC tutor, while going to NWACC full time and working full time. What a guy! Literacy Council of Benton County's student 54-year old Joe Arnold is a great guy who had a unique start in life. When Joe was a baby, his father was outside holding him when lightning struck Joe's diaper pin, traveled through him, injured part of his brain and blinded him in his right eye. In his soft spoken manner, Joe talks about going to school. "The kids on the bus made fun of me. They called me 'retard' and 'stupid.' I wasn't stupid; it was the brain injury from the lightning that just made it hard for me to learn to read. But I understood things!" Joe stayed in public school until the fourth grade. He was then transferred to a school for developmentally delayed or disabled children. At that time there wasn't much known about teaching people with learning disabilities, and although that school was a great place for a child with Down syndrome or a very low I.Q., there wasn't much done there to help Joe. He left when he was 15. He still couldn't read. Joe had no problem getting his driver’s license or his HAZMAT certification, because those tests were read out loud to him. Fast forward to 2007 when Joe came to Literacy Council of Benton County with a goal of obtaining his GED so he could improve his employment. Always hardworking, he does physical labor now and is hoping to find something less strenuous as he gets older. There are better job options open to him, but he needed his GED. At LCBC he was matched with a great tutor who patiently worked with him, and he did progress, just not as quickly as he would have liked. His tutor asked if Joe had been tested to see if he had a learning disorder. LCBC's Literacy Coordinator Jennifer Vandiver arranged for Patti White (Disabilities Project Manager with Arkansas Adult Learning Resource Center) to evaluate Joe. Upon her recommendation, Joe was referred to a GED examiner and a psychologist. After their extensive examinations, Joe received approval for accommodations in his quest for his GED. Joe and his tutor got down to some seriously dedicated study sessions, with help from Northwest Technical Institute in Springdale, where Joe took his GED tests. In the first part of April 2011, Joe took the last of the three GED tests. Then he waited. On April 28, 2011, his mailbox held his long-sought GED certificate! He walked in a ceremony in Springdale on June 21, 2011. The kids on the bus were wrong. You go, Joe! Frances no longer keeps her biggest secret…. For decades, seventy-three year old Frances Dillard went out of her way to make sure no one discovered her deepest, darkest secret. "I couldn't read," Dillard said, shaking her head slowly from side to side. "I went to school through the ninth grade back in Texas where I grew up but when I was tested at the Literacy Council, I was only at the fourth grade level. My wonderful tutor, Rhonda Davis, has been great to help me. I just have a few more weeks to practice for my GED test. I can't believe it." "A Bentonville High School counselor is the one that referred me to LCBC. I was visiting the counselor about my grandson. I guess I had always thought I was too old to learn to read but what I've found out is that nobody’ is too old. I am proud that I came here and so glad that I can read well. It really is a blessing for me." Dillard explained how she memorized a lot of words before taking her cosmetology licensing test years ago. She said she was always careful to limit what she talked about because she didn't want anyone to figure out her secret. "I was ashamed," Dillard admitted. "But I just didn't know I could do anything about reading until that counselor told me. I had to wait three months for a tutor. They really need more tutors here. Once I knew I could read, I felt so much better about myself and everything. It i’s like a light turned on. It has made such a big, big difference in my life. I'm proud now." Dillard has a message she wants to deliver to people who can't read. She wants them to know there's a place where they can learn. "I want people who can't read to realize that there is no reason to be afraid to go to the Literacy Council," Dillard said. "They won't feel embarrassed or intimidated or anything. The tutors and everyone at LCBC are here to help us. They're open and patient and I never felt anything but happy when I started with my tutor." 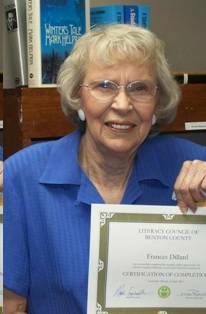 "I suggested to my 80-year-old sister to go to the Literacy Council in her hometown. It is never too late. And the difference in how you feel and what you can do. Well, it's a blessing, it really is."